Though the Month of Letters is over I know for a fact that many of you taking this challenge will continue to send out letters and cards and postcards throughout the year. Maybe not so many as this month, but more now that you have the letter writing bug. For those of you who particularly enjoyed sending out postcards, I have one final post for you. Last year I talked about how much I love being able to send custom postcards right from my smartphone. I still do, and I still use Touchnote to do so most of the time. When this year’s challenge rolled around I decided to try and determine if Touchnote is really the best app for this purpose. The cards cost $1.99 and come from Europe, so they take some time to arrive. Were there any worthy services doing it faster or cheaper? Throughout this month I tested postcard apps to find the answer to that question. The answer? Not really. Touchnote is still one of the best smartphone postcard apps out there. The only one I like better is MyPostcard, which is not cheaper or faster. How did I go about making this determination? I started with some basic culling. 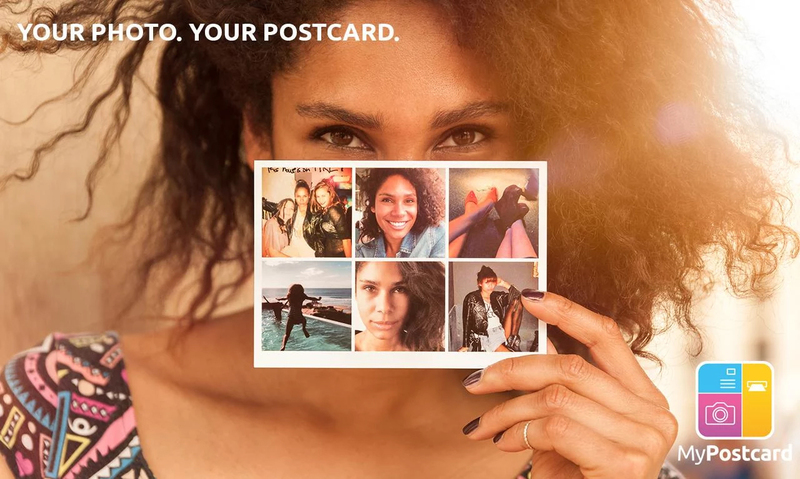 There are a little over a dozen apps and services that offer the ability to create and send a postcard from your phone using your own image. Before I started testing, I whittled the list down by eliminating apps that are iOS only (no app can be the best if it ignores Android) and those that have really low ratings and terrible reviews. That left me with four contenders: MyPostcard, Popcarte, Postino, and Touchnote. Next, I used the apps to create a postcard to see how easy or difficult the process was. Postino had the most unintuitive interface of the four. No Back button, no guidance on whether you’d saved the text or image or address, and no help text at all. It also withheld key information from me until the very last step in the process: how to pay. Trying to send a postcard brings up an error message, yet gives no clear instructions on how to solve the problem (i.e. how you buy the postcard and postage). This process is too convoluted. Once you stumble through that the card finally gets sent. When it arrived the postcard looked the same as the preview but the card stock was not as high quality as i’d hoped. Plus it took longer than stated. Postcards cost $1.99 to send one, but if you buy in bulk you get a slight discount. It’s not worth it. The Popcarte interface is slightly better than Postino, but not by much. As you move through each step of setting up a card there is no easy way to go back and change an element. You have to keep hitting the Back button until you’re where you need to be. This was very frustrating because the preview of the card did not match how I positioned my image. Thinking it might just be a bug, I sent the postcard, anyway. It arrived looking like the preview image–i.e. kind of jacked up. Not worth $1.99. Touchnote has an intuitive interface that is well-designed and easy to navigate. I like that I can choose a picture from my gallery and Share it to Touchnote instead of starting from inside this app. Also like that there’s a generous character allotment for the message on your postcard. The only thing I don’t like is that I can’t choose a font face or size. The card I sent arrived in the stated time frame and looked as I expected. MyPostcard stands above the rest for several reasons. The first is that you can put multiple images on one postcard. Choose either one photo to fill the frame, three photos, or a six photo grid. When you type out your message you have 450 characters to work with, but when you’re done with text the app will warn you if the current font size means the whole message won’t fit. The app is easy to navigate. Postcards cost €1.99 and you can pay via PayPal. The card arrived looking better than I thought it would and within the stated timeframe. So there you have it. If you’d like to send postcards from your phone using your own images, Touchnote and MyPostcard are your best bets. I hope you enjoy doing so!